Companies can make brilliant moves, but there are plenty of times when things don't work out quite as planned. From single-serve coffee giant Green Mountain taking aim at the full-pot business, to Apple paying the price for the iPhone 5c's poor sales, here's a rundown of the week's best and worst in the business world. Shares of the leading social networking website operator hit new highs on Thursday after it posted another quarter of blowout results. Facebook now sees 1.23 billion unique monthly visitors, 16 percent ahead of where the site's traffic was at a year earlier. Folks are also coming more often, with daily active users up 22 percent. The company has done a great job of monetizing both its desktop site and its mobile app. Online ad revenue soared 74 percent during the quarter. The market was clicking the "Like" button when the report came out, sending the shares 14 percent higher on Thursday. These days, Apple lives and dies by the iPhone, and that explains why the stock took a hit on Tuesday after it reported weak sales for its new smartphone. Apple sold a little more than 51 million iPhones during the holiday quarter. This is certainly an impressive number, but analysts were hoping for closer to 56 million devices. The culprit in the shortfall is clearly the iPhone 5c. We know this because it's the one that was readily available after the pricier iPhone 5s sold out during the debut weekend for both products. It was confirmed this week when Apple reported a healthy uptick in average selling prices for its iPhone, implying that the more expensive smartphone was the hotter seller. Apple was trying to make a dent in the entry-level market with the iPhone 5c, but consumers weren't wowed by its pastel colors, its plastic shell, and specs that were inferior to the iPhone 5s, which sold for just $100 more. It was a busy week for SodaStream as it bounced back from having its Super Bowl ad censored by posting the original on YouTube on Monday. The commercial, starring Scarlett Johansson, has become a viral hit, generating more than 5.5 million video views. When SodaStream runs the ad during Sunday's big game, it will simply strip out the "Sorry, Coke and Pepsi" zinger that Johansson says toward the end of the spot. However, the extra publicity of being "banned" for daring to mock the soda giants is getting its uncensored ad in front of millions of people -- for free -- ahead of the game. Shares of Yahoo slipped after the company posted another quarter of declining display advertising revenue. Investors should be used to this by now. Most of the excitement surrounding Yahoo has come from the growing value of its stake in China's Alibaba. The stock has been a market beater since CEO Marissa Mayer stepped in as CEO two summers ago. She has certainly helped improve the market's perception of Yahoo, but at the end of the day she has struggled to grow the dot-com pioneer's fundamental online business. Alibaba has been the big driver in her tenure, and that deal was in place long before her arrival. Sooner or later, Yahoo is going to have to show material growth in its online advertising revenue. The company behind the Keurig brewer that makes single-cup servings of coffee, tea, and other hot beverages revealed that it's next Keurig system will also have an option to make an entire pot of java. This is a pretty big deal. 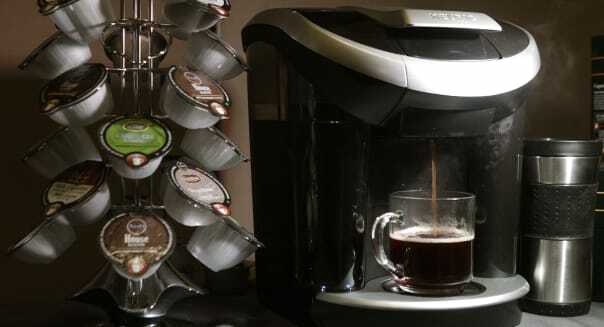 When the Keurig 2.0 appliance hits the market in the fall it will be the first machine that accepts K-Cup portion packs for single servings and also the new K-Carafe pods that crank out a 28-ounce pot of coffee. This is an important move for the company, because while Green Mountain lost patent protection for its K-Cups in late 2012, it now has a new proprietary product that's tethered to the system making the industry standard K-Cup. It's a caffeinated Trojan horse, if you will.